"Only I saw Narian for who he truly was: a young man with courage and an independent mind, and made to pay for what was outside his control. He couldn't help his past any more than he could help the way those intense, deep-blue eyes pierced me and held me captive. Faced with the greatest betrayal a heart can know, Alera must set aside personal feelings and lead her kingdom through its darkest time. And when all hope, will and courage seem lost, she must find strength and remember that even the blackest night must have a dawn...."
I was pretty hesitant to read the second installment in this series because of my feelings in Legacy,but decided to give it another try. More than anything, I wanted to see where the story went. I'm honestly still kind of unsure on whether I regret reading this or not. This book starts off right where the last book left off, and I really thought it'd be better than the first. Though paragraphs were still unnecessarily long and detailed, I found the story to be more interesting. I still pulled for Narian throughout this story, but I actually really started to develop a desire to see things work out with Steldor. Kluver reverses the tables in this book and shows us sides to the male leads that I didn't really ever expect. Though there were some improvements in this story, there was one major area I was hoping would've been worked on; Alera. In the first book I gave her a lot of forgiveness for being the way she was because she was given a lot of responsibility and was still a child learning. However, it seemed like this book not did nothing about that, but multiplied it by ten. With her position in the kingdom, I hoped she she would've behaved a bit differently and had a little more understanding. I couldn't get past how other characters had this image of her that never actually held up to who she actually was. Like in the first, she never held up to her expectations until told to do so. Bt the time Alera did actually step up to her position, she'd lost most of her respect. The plot of this story is still engaging enough to read the book, but still lacks in development in areas. 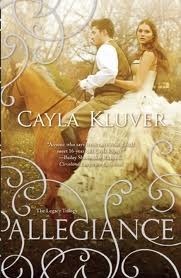 Kluver's writing excels in pulling at the heart and mind where it lacked in the first, but still keeps you coming back for more. With an ending that finally gives a little closure, I hope to see Alera finally step into her proper role by the third installment. I really like the cover of this one. And the summary sounds great. Thanks for the review!